Kerry Washington is calling out Adweek for a cover photo she says looks nothing like her. The “Scandal” star took to social media on Tuesday to set the record straight about the photoshopped picture. The actress’ unhappiness over the cover was in contrast to her initial feelings about being asked to appear on the magazine. “When they invited me to do a cover, I was excited and thrilled. And the truth is, I’m still excited. I’m proud of the article. And I like some of the inside images a great deal,” she explained. She concluded her message with, “Thank you for being patient with me while I figured out how to post this in a way that felt both celebratory and honest.” On Tuesday night, Adweek’s editorial director Jim Cooper responded on Twitter. 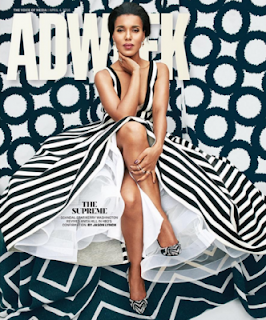 “Happy @kerrywashington was proud of her Adweek profile, sad cover misses for her. Added volume to hair for dramatic effect. No disrespect,” he wrote.